A Mississauga man has been fined $3,700 and had his fishing licence suspended for five years for multiple fishing violations. José Garcia was fined $3,000 for catching and retaining cisco during the closed season, $300 for fishing without a licence, $200 for unlawfully using another person’s fishing licence and $200 for obstructing a conservation officer. A previous conviction for fishing without a licence was considered in sentencing. 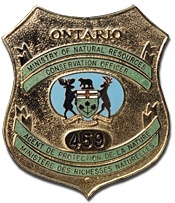 The court heard that on March 8, 2014, Ministry of Natural Resources conservation officers were on snowmobile patrol on Lake Simcoe when they inspected two men fishing inside an ice hut. At the time, two cisco were presented to the officers. Further inspection of the area resulted in the discovery of 95 more cisco in a garbage bag located behind the ice hut. Additional investigation also revealed that Garcia had been using another man’s fishing licence. The man who was fishing with Garcia has been charged for his role in catching and retaining cisco during the closed season, and another man faces charges for enabling Garcia to unlawfully use his fishing licence. Justice of the Peace Maxine Coopersmith heard the case in the Ontario Court of Justice, Whitby, on May 30, 2014.